It’s the first day of fall quarter at UC San Diego. Campus—and all of La Jolla, Calif., for that matter—is bustling with first-year and returning students navigating new schedules, unfamiliar faculty and capstone projects looming on their syllabuses. Among the new faces is Silvino Silvino. He is walking to Home Plate, a popular campus eatery across from the School of Global Policy and Strategy (GPS) to meet an old friend for lunch. Unlike other incoming students Silvino, 2017 MAS-IA candidate, is here not with a career goal in mind but with a career to step back into after completing GPS’s yearlong executive education degree program. As a foreign area officer (FAO) in the U.S. Army, Silvino is required to earn a graduate degree in his regional specialization that is Southeast Asia—making GPS, with its depth of faculty expertise in the region, an ideal place to do so. Ending his short stroll, Silvino spots his friend, the one who was in his same shoes just a few years prior and the sole soldier who put GPS on the map, so to speak, for FAOs like Silvino to attend the program. As the first FAO ever accepted to the MAS-IA program around five years ago, Jason Kim, MAS-IA ’12, acted as the Army’s exclusive testifier to get GPS on the Army’s list of approved FAO schools. This entailed even rounding up CVs and copies of MAS-IA program curriculum to be presented to his higher-ups. 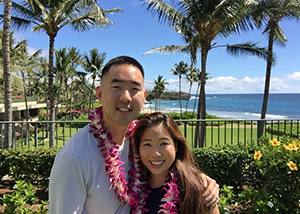 Now a major in the Army based as a Northeast Asia FAO in Honolulu, Kim’s commitment to the GPS remains unfaltering. In one respect, Kim has given back to the School more than 20 times over—the number of FAOs who have completed GPS’s MAS-IA program since he was accepted and due in part to his kind efforts to inform fellow FAOs about the program, passively and by word of mouth. In another, the School has Kim to credit for unveiling its capacity to prepare FAOs to specialize in the Asia-Pacific, with a foundation in quantitative methods and analysis. As Brian Foster, MAS-IA ’16 and a FAO currently stationed in China, puts it, the School houses a “hidden pocket” of talent. Kim took notice to this, too, which is why he began informing fellow FAOs about the MAS-IA program quite immediately after hitting submit on his own application. Per Kim’s recommendation, his colleague Stephen Hwang became the second FAO to apply and be accepted. They graduated together in 2012. Moreover, it was the positive impressions during the application process that convinced Kim GPS was his best fit. First, Kim said, he was surprised by the receptiveness and flexibility of the staff to his email inquiries during this time. “The attentiveness, care and respect the faculty and staff gave to prospective applicants was unmatched,” Kim said, noting this was his big selling point to encourage Hwang to apply, given he was having to do so from abroad at the time. 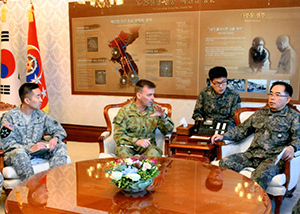 Second, Kim said, the Asia-Pacific focus was imperative. Lastly, the fact that San Diego is a military town, with robust service and support facilities for military families, played into his decision. Per usual, the beautiful weather in San Diego seemed a perk to Kim as a prospective student—especially as one who had dared the cold in his undergraduate years at the U.S. Military Academy. Still today, Kim keeps close ties to Haggard, from getting his perspective on issues occurring in North Korea, reading his blog and, in the instance of this first day of school, returning to campus to attend his former professor’s public speaking event. Kim said he also often recollects lessons learned in game theory from Barbara F. Walter, using the concept consistently in his role today in complement to his analytical writing skills gained at GPS. This—seeing the tools and skills from GPS put into action directly after graduation—is what impressed Kim so much about the MAS-IA, he said. It’s also his impetus for staying connected to GPS, including as an ad-hoc member of the GPS Alumni Board. In truth, he’s grateful for how his year invested in the School paid off.